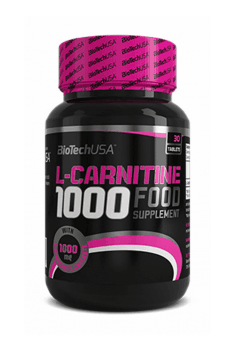 Biotech USA L-Carnitine 1000 is a dietary supplement with 1000 mg of l-carnitine tartate per serving. The formula promotes effectively body fat reduction, stimulates metabolism and contributes to an increase in strength and energy. L-carnitine is a natural substance whose most abundant levels are found in the skeletal muscles, heart and liver. It is synthesised in the body from lysine and methionine, although this amount is not sufficient for optimum fatty acid metabolism. In addition, endogenous L-carnitine synthesis decreases with age. L-carnitine has an important role in lipid metabolism. It transfers long-chain fatty acids from the cytoplasm into the mitochondrial matrix where they are combusted into water and carbon dioxide with the release of cellular energy in the form of ATP. It is also critical to transport of short-chain fatty acids from mitochondria into the cytoplasm. Long-chain fatty acids, which are transferred into the mitochondrial matrix by l-carnitine, undergo β-oxidation. It is a series of biochemical reactions which leads to the breakdown of fatty acids. Breakdown products, among other things, acetylcoenzyme A, are also substrates for next metabolic pathways which results in the production of cellular energy as ATP and ketone bodies in the liver. An increase in ATP concentrations in the body ensures high energy levels for metabolic processes. Optimal levels of ATP are necessary for training persons because it is the basic, quick source of energy required for muscle function and physical activity and with a beneficial impact on training performance. L-carnitine regulates blood cholesterol levels. It has been shown that l-carnitine contributes to lowering total cholesterol and triacylglycerol levels in the blood. Owing to that, l-carnitine helps prevent the development of overweight and obesity and has a positive impact on cardiac and cardiovascular function. L-carnitine shows antioxidant activity. It has the ability to disrupt or inhibit free radical chain reactions. It protects thus phospholipids of cell mebranes and unsaturated fatty acids against peroxidation, stabilises cell membranes, among other things, in neurons and erythrocytes and strengthens blood vessel walls. To sum up, Biotech USA L-Carnitine is recommended especially to individuals on a slimming diet, with overweight and obesity, leading an active lifestyle or athletes and for increasing the effectiveness and intensity of training and making it easier to get your dream figure. Take 1 tablet per day 30-60 minutes prior to your workout. A good idea is to combine L-carnitine supplementation with a product with green tea extract because these substances have synergistic effects on stimulation of fat burning. Such combination enhances the effectiveness of body fat reduction. Calcium glycerophosphate, hydroxypropyl methylcellulose, magnesium stearate, stearic acid, iron oxides, iron hydroxide, tartrazine, FD&C Yellow 6.